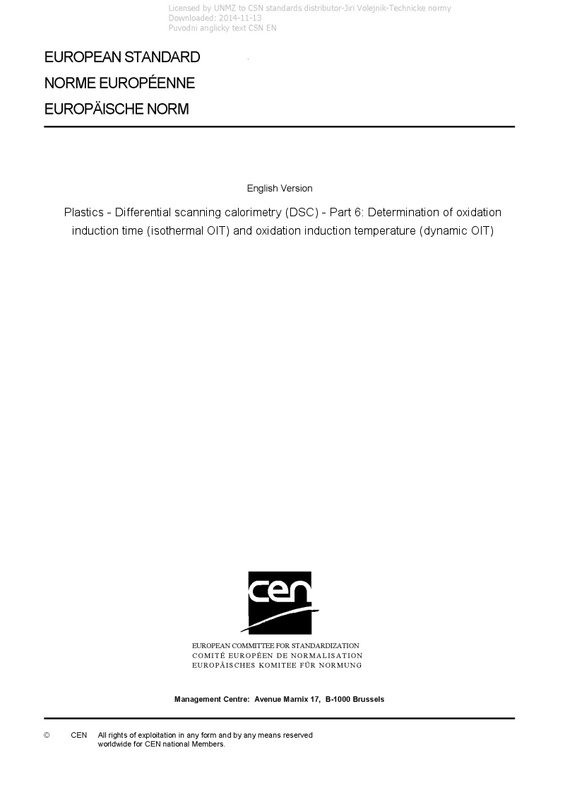 EN ISO 11357-6 Plastics - Differential scanning calorimetry (DSC) - Part 6: Determination of oxidation induction time (isothermal OIT) and oxidation induction temperature (dynamic OIT) - ISO 11357-6:2018 specifies methods for the determination of oxidation induction time (isothermal OIT) and oxidation induction temperature (dynamic OIT) of polymeric materials by means of differential scanning calorimetry (DSC). It is applicable to polyolefin resins that are in a fully stabilized or compounded form, either as raw materials or finished products. It can be applicable to other plastics.